Ogi Eyewear carves an exclusive niche within the world of high fashion with the Natural Instinct collection, designed to emulate the timeless beauty, multi-tonal colour, and tactile textures that one can find in the natural world around us. Each frame exudes a unique essence of personality, driven by colourful, organic hues in combination with handcrafted details and patterns. “The Natural Instinct collection was inspired by the worldly traveler, one who sets out to find beauty in the smallest details of all that the world has to offer. The soft, organic shapes, along with the intriguing textural details of each style coalesce beautifully to create a look full of originality and distinction,” says Karly Anderson, marketing and design. The 3112 model features soft, organic curves that revitalize the traditional silhouette of a classic P3 shape. 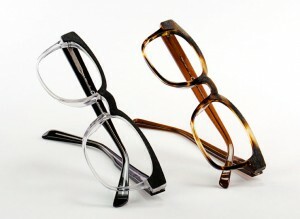 Each frame features an emphasized brow, textured with an innovative “wooden” brushed acetate effect. Subtle earth tones, such as dark tortoise/antique crystal and black/crystal, give this model an intriguing intellectual look, featuring larger lenses and a classic keyhole bridge. Ogi Eyewear’s 3113 frame debuts with intriguing colour combinations and a distinctive “wooden” appearance. Camouflage tone marriages, such as red-purple camouflage/blue and orange camouflage/black, present a unique colour palette for the 3113 model. Smooth, organic curves complement this acetate design’s semi-rectangular shape to produce an essence of individuality. This entry was posted in montures by Envision Magazine. Bookmark the permalink.